It's been a month since we had our Videoke night but until now, I still can't get away from the fun and excitement that we had during the night. It was actually a treat of my son Edmar to his Dad who had celebrated his birthday last 9th of February. The night was filled with fun and music. We are not a family of singers although my daughter sings well and could play guitar. 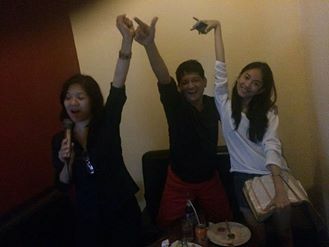 That videoke bar is plain and simple but we had loads of fun. I wouldn't say that the sound system is great, it would had been much better if they had mad professor but since it was our first time as a family to visit a KTV, the quality of the sound system doesn't affect our "happy mood" at all. It's good that the cost of the room is consumable so we were able to feast with foods and drinks. This has been one of the highlights of hubby and son's home leave and we are very grateful that we can get this opportunity to be complete as a family.